These oversized square invitations feature our Tungsten letterpress ink along with a digitally printed "tigers & lemons" wedding seal provided by the couple. 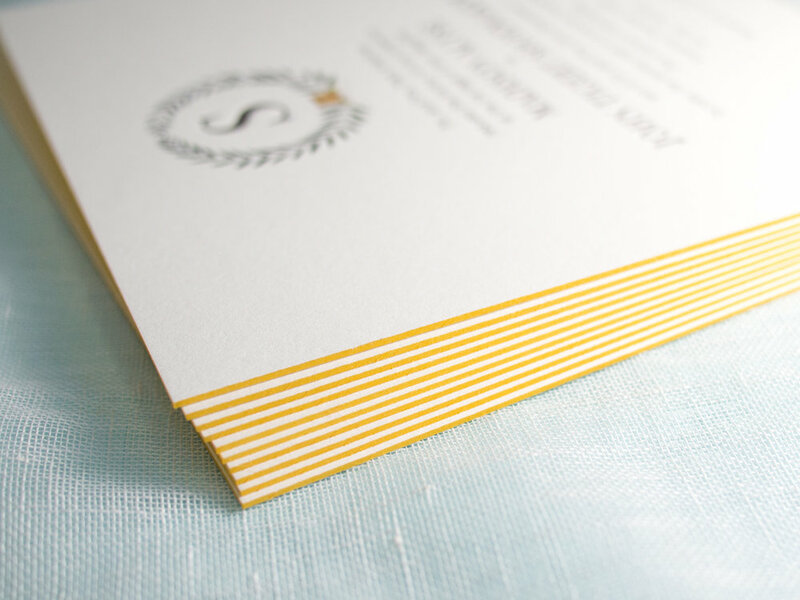 The invitation is printed on our thick 600g Pearl White paper with bright gold edge paint, and it's paired with a metallic gold liner. The typeface combo is great: All caps Bodoni with sans serif Neutra Book. We also printed mini directions booklets using the same ink combo, but on our lighter-weight 300g stock. Posted in wedding invitations and tagged with gold, inkjet, digital, monogram, pearl white, 600g, edge painting, 300g, directions, envelope liner. December 20, 2016 by Travis Friedrich. Wonderful logo design by The G Brand. Printed on both sides with gold ink on 60pt black museum board. Posted in business cards and tagged with logo, gold, black, rising museum board, square. December 13, 2016 by Travis Friedrich. Another awesome duplexed card. 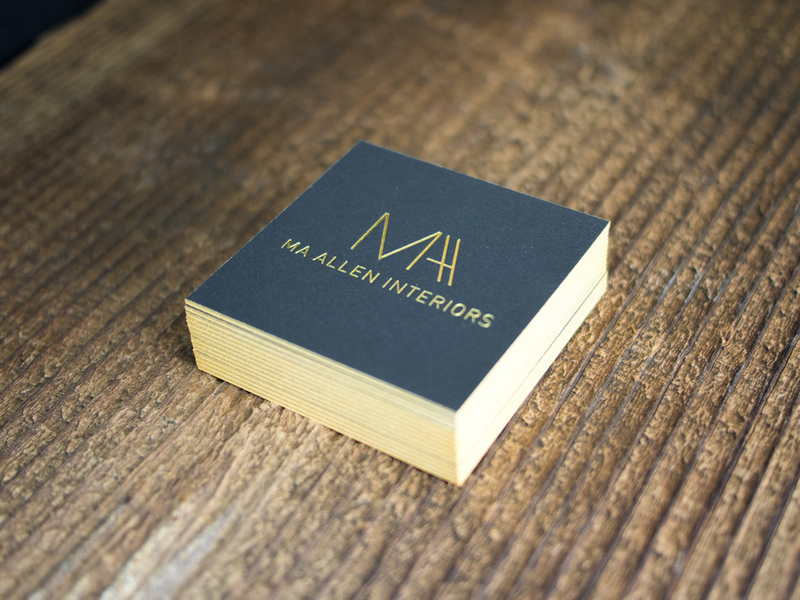 This one's for interior design firm, MA Allen Interiors. 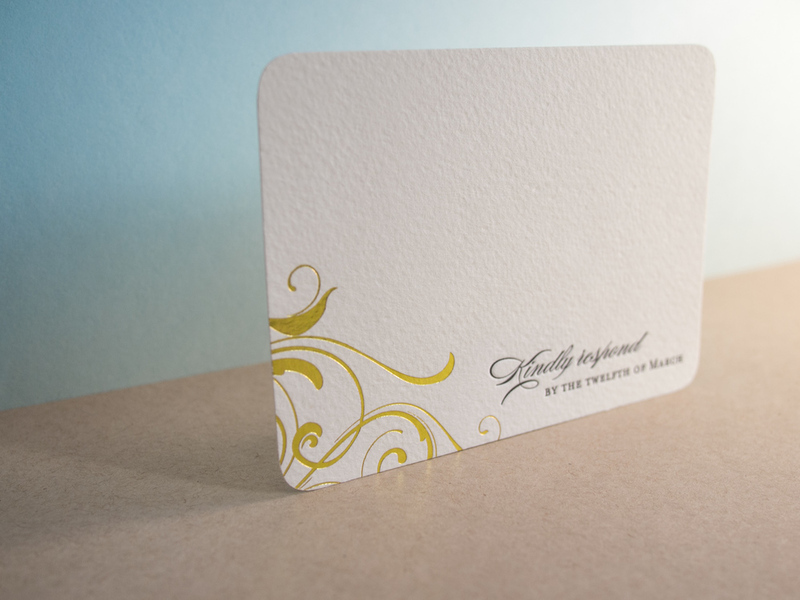 We actually printed wedding invitations for the firm's founder back in 2010, and she came back to us for business cards after opening her Raleigh firm. On the front we've got gold foil on 30pt black museum board — and on the back, the same gold foil on our pearl white 300g (21pt) house cotton paper. 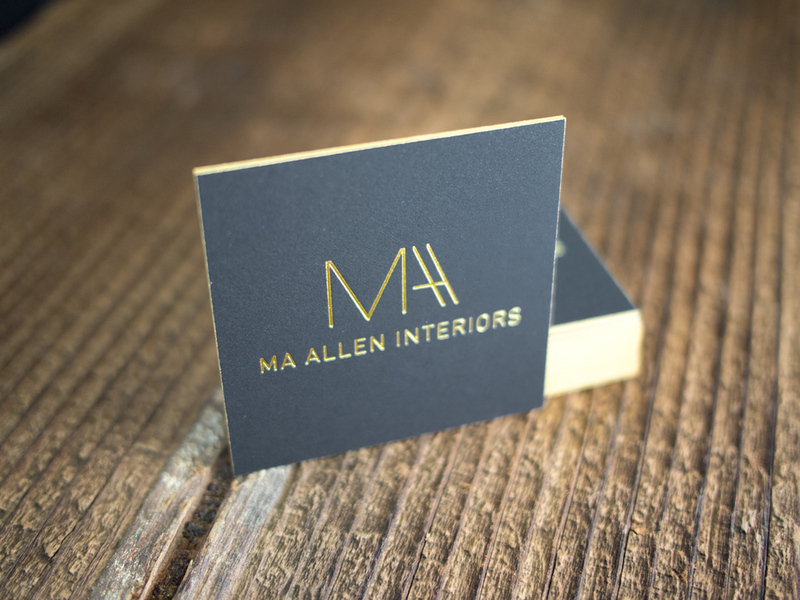 Posted in business cards and tagged with gold, gold foil, black, rising museum board, edge painting, Pearl White, duplex. June 7, 2016 by Travis Friedrich. Perhaps you've seen some of Chad Martin's design work on this very site in the past (here, here, here, or maybe here). For this set, we printed cards for Nequette Architecture & Design along with some similar cards for Chad's company, The G Brand. 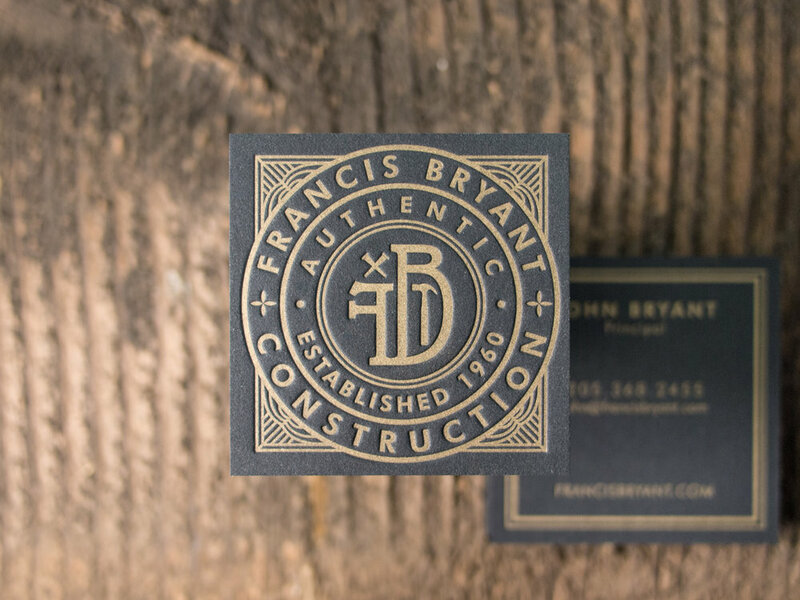 These mini 1.75" x 3" cards feature gold ink on 30pt black museum board. Posted in business cards and tagged with gold, black, rising museum board, 30pt. May 17, 2016 by Travis Friedrich. For Courtney and Ben's set, we started with our popular Whirl invitation, but added gold foil and edge paint for some extra pizzazz. 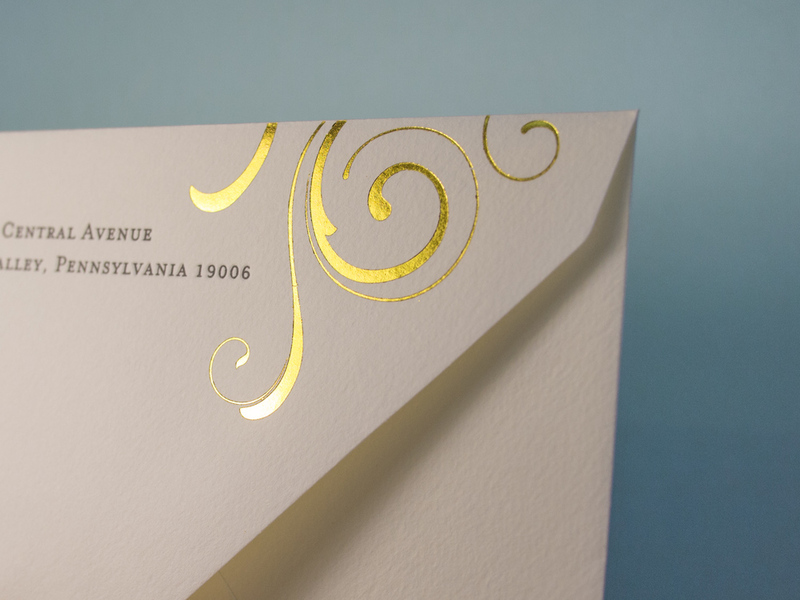 The original Whirl uses gold ink, which has just the slightest hint of metallic shimmer. 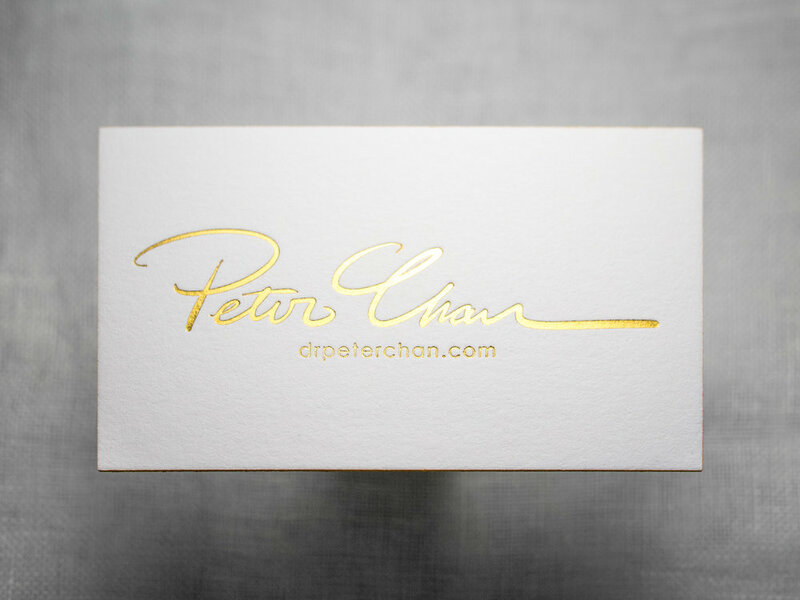 But gold foil is something else entirely — it's extremely shiny with a reflective mirrored look. And if you'd like something in between, our gold satin foil is a little less intense than the gold shine used here. 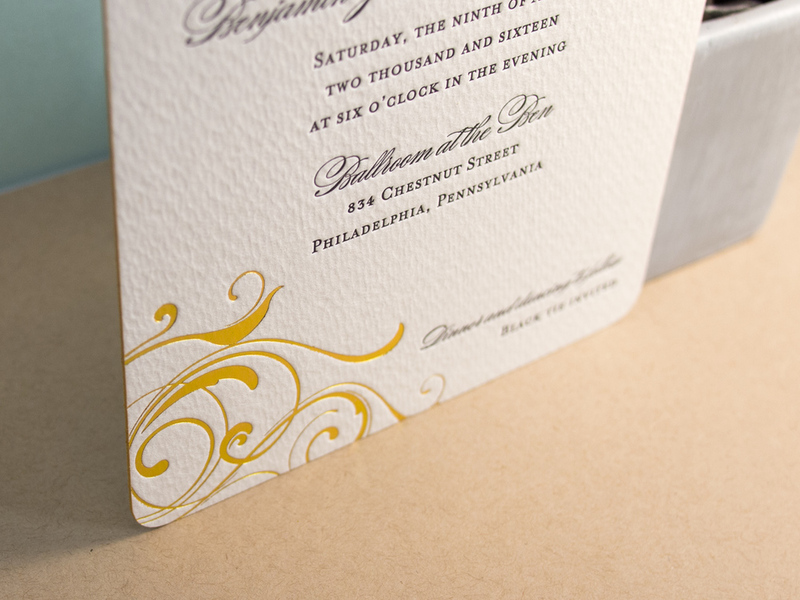 For paper, Courtney and Ben went with our thick and textured soft white 600g Arturo in a 5x7 size with rounded corners. We finished out the set with our euro-flap Arturo envelopes and a gold foil + black letterpress flap. Posted in wedding invitations and tagged with gold, foil, rounded corners, edge painting, Arturo, black, whirl, soft white, Burgues Script, Mrs Eaves, reply card, envelope flap. May 10, 2016 by Travis Friedrich.